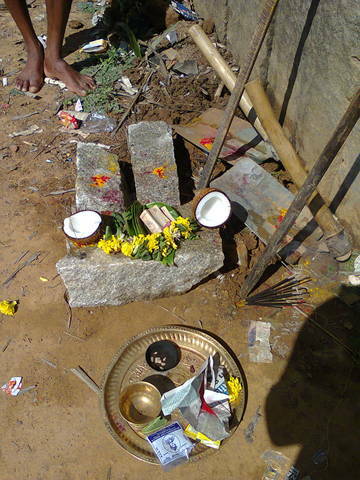 Angashettyhalli is 5 km from Malur town, and 5 km away from Areleri GP , this small village has 91HH of 448 population. 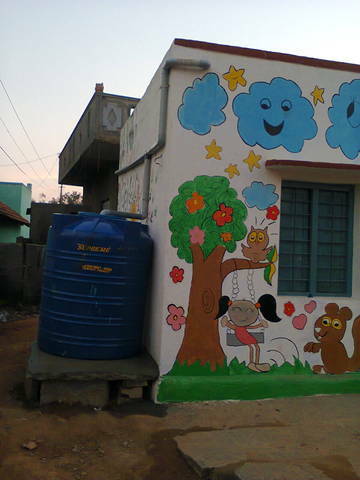 based on a community and children need the module project of rainwater harvesting and sanitation programme is planned. Building, construction we thought as a time limit job, we can hire a local community members who are construction workers themselves to complete the task, but every step we realized it was not a simple work when you’re committed to make participation. 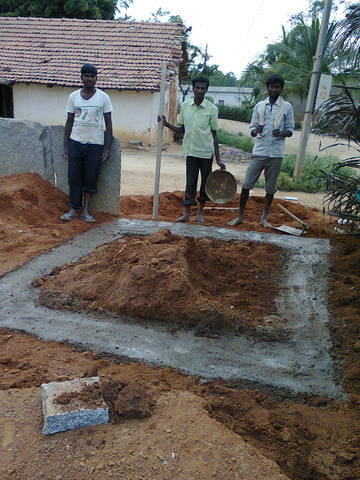 The series of meetings were conducted with teachers ,masons and got two to three high quoted estimated .Based on this and to learn , the organization took up day to day monitoring , and purchase of required materials through staff Krishnamurthy and local elder will support the whole process, hiring local laborers. Every step had a review discuss and correction if needed with chandrababu and myself and fields staff. Many time with village community also, when they expressed they want to use toilet as one more room not as a toilet. 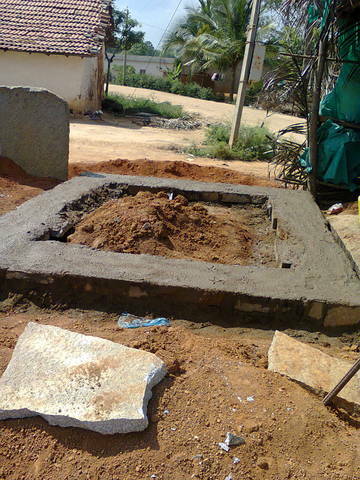 The construction of both Rainwater harvesting (23 long/14 ft width) and toilet with two seater(10/8) has been completed with the budget of 43000.00 rupees apart from organization administration cost. The skill and experience has been gained by the staff. The review every week, every day phone and mail exchanges and weekly visits from head office to support and guide the field staff. In spite, some of the Quality required in fitting window, toilet seats and filters is not up to the mark as planned, due too availability at local area. 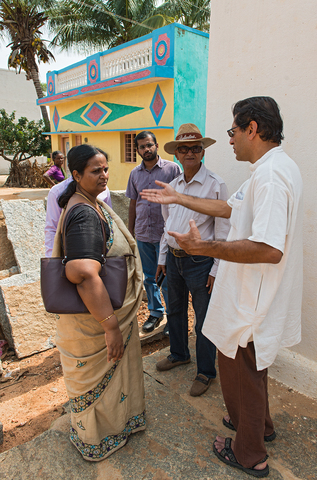 I visited Angashetty with AA Foundation and got this unique opportunity to see the completed water and sanitation project in the angadwadi and also talk to the women who send their kids their. 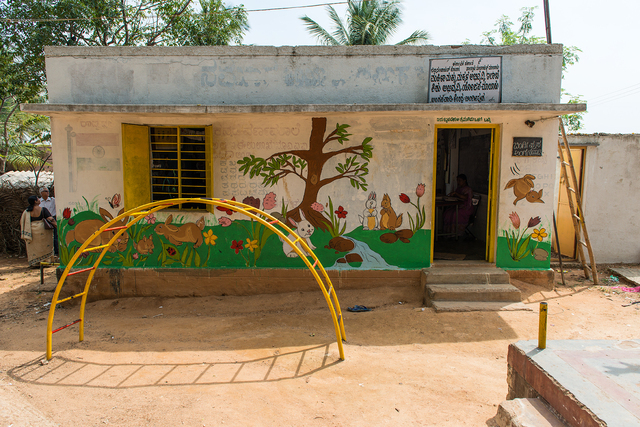 Before the water and sanitation projects weren't in place, parents weren't very keen on sending their kids to the Angadwadi and rather leave them at home due to obvious reasons. But many thanks to the initiative taken by PWX and AA Foundation, the sanitation and water problems are now solved and up and running and kids are sent regularly to the angadwadi with its safe and hygienic environment. The toilets were in use and considerably in good condition with no odor. 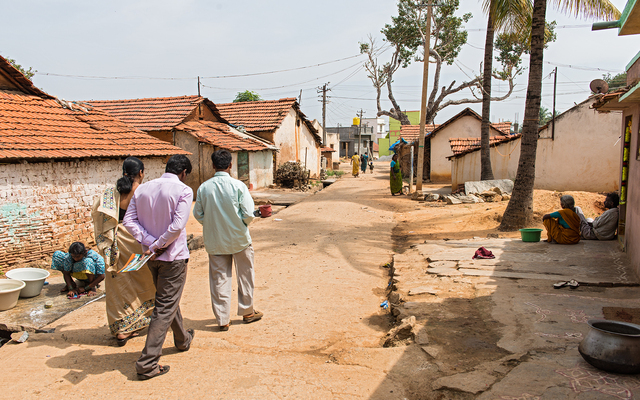 The caretakers of the angadwadi did a good job to keep the system up and running. 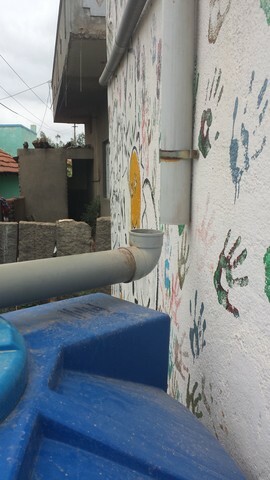 However, the rainwater pipe that runs from the rooftop to the tank below was displaced, the reason given was that the kids while playing had dislocated it. I guess this is a small issue of maintenance which will be taken care in the future. 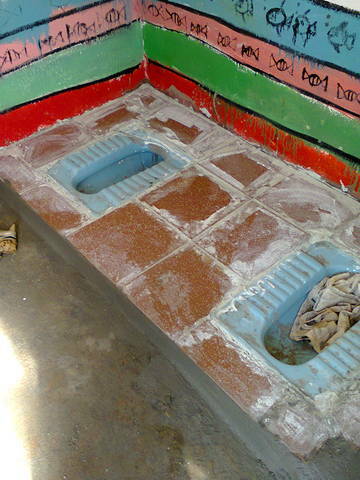 The toilets were being used and well maintained. No odor. The rain barrel on site was about 1/2 full but the pipes draining the roof were no longer connected. The teacher said that the children play with it and broke it recently. The water was used to clean the bathrooms and also used for cooking. 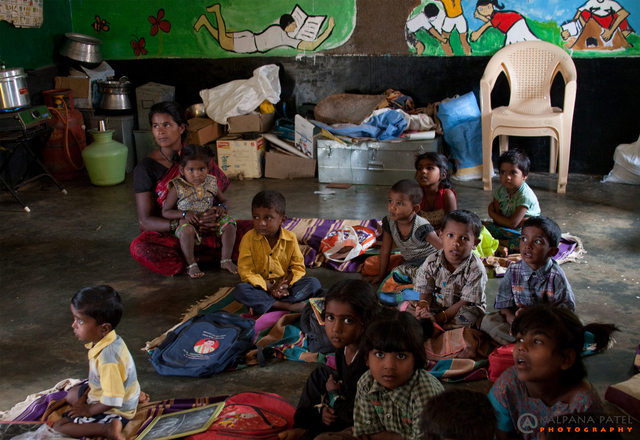 The organisation has been supporting the anganwadi center in upgrading the quality of education ,health and also maintenance of infrastructural , recent information collected by our staff nandini has shown a remarkable increase in attendance of children to the the angnawadi, regular visits , inputs , activities and improved infrastructural such as water resources and toilets is one of the factor. The angnwadi staff also been supporting in terms of maintenance and receiving the inputs such training session on health and education. Myself visited along with advisory board Ms Indiraswamynathan who intracted with anganwadi and class 1st and 2nd children, deomosnstrated for teachers and staff many simple methods to stimulate learning among children, the half a day session with children was interesting and beneficial accr to teachers. 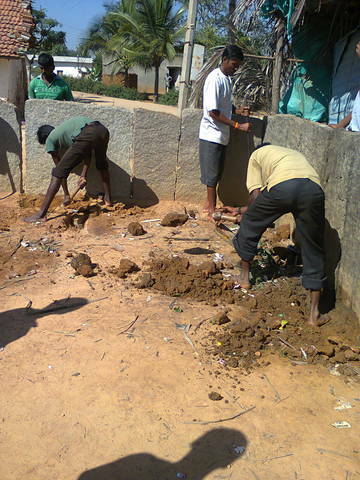 It was also observed the toilets were maintained by angnawadi helpers.And regularly used by children. 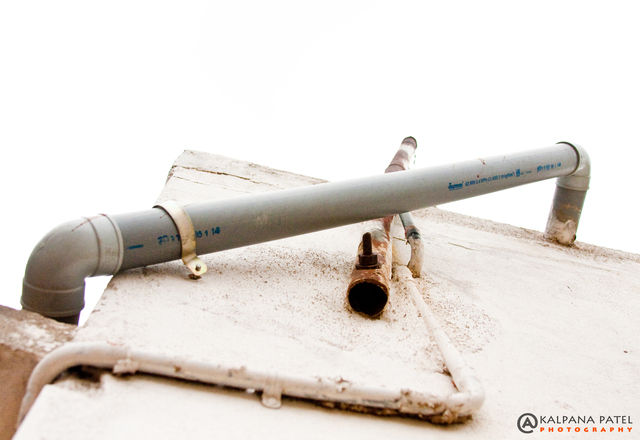 the watertank was full with water supply from GP. the tree planted in the month of November has all survived and care taken by children. 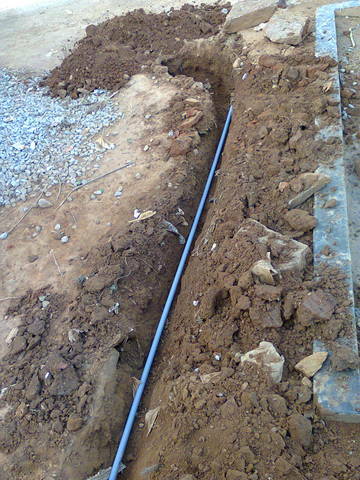 as of now all the work have been completed and also water connection has been made. Nandini field educationist , have worked a time table with anganwadi teacher, before they didin' t had specific timing for using rest room, now the timings are made morning 10,after noon 1pm, and evening 3 pm, although the children who are very small and not used. teachers have guided to make it dialy practice. Grampanchayat secretary had visited the project site, and give permission to drawn panchayat water from the Cistern out side. 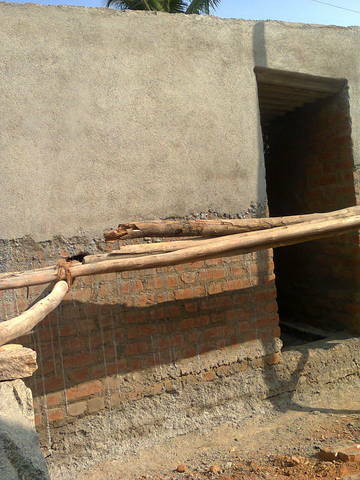 The women and child department has been informed , and GP about completion of the work,GP needs some time to give water connection , as it is busy in elections. We thank all the villages laborers who involved in construction work and Mr Chandrappa village elder who monitored the work, Also all the school teachers who initiated discussion and involved in budgeting. Also Our staff who through hard work gained good experience. and volunteers team who filled the AW center and toilet with colors and planting trees around. We thank PWX who supported and guided us to do things in our time. Our followups will be effective usages of toilets by the children, increased learning among children in usage of toilet,(in turn influencing their families to built a toilet in houses) importance of safe drinking, saving water , and planting trees. This will be disseminated in each angawadi through teaching aids by the foundation with angawadi workers. 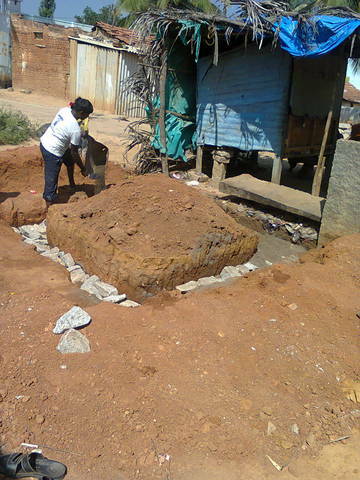 The women and child department has been informed , and GP about completion of the work,GP needs some time to give water connection , as it is busy in elections. ( till then there is GP bore well supply to cistern in front of anganwadi, they have to fetch the water from there as they are doing now). Our followups will be on effective usages of toilets by the children, increased learning among children in usage of toilet,(in turn influencing their families to built a toilet in houses) importance of safe drinking, saving water , and planting trees. 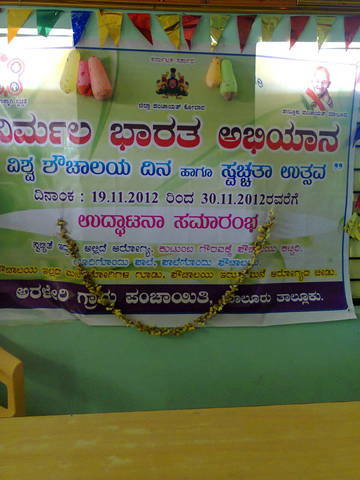 This will be disseminated in each angawadi through teaching aids by the foundation with angawadi workers. 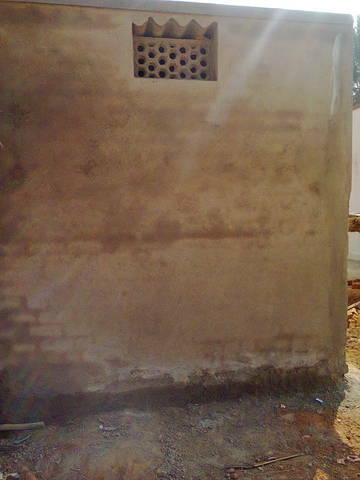 The tiles work is completed and all related work to toilet, the photos will reach us on 12 th evening. The logo painted by children and volunteers needs correction . On 9th evening Sunday,Chandrababu,krishnamurthy and myself had a review for 2 and half hour, taking feedback and experience of krishnamurthy in the process, difficulties ,challenges he faces , corrections to be made for next project and few alterations required for toilet and RW. 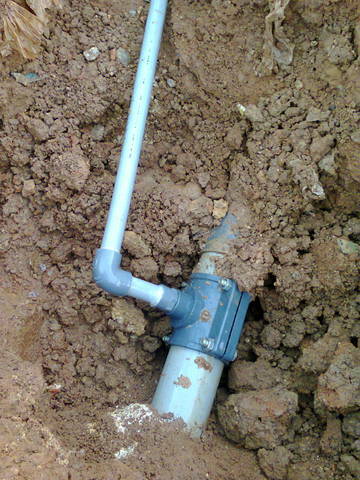 The project of toilet construction and RW has been completed on 7th late evening , the last few cleaning up and fixing up pipes connection will be done on Sunday. The foundation had organized child friendly wall painting on 8th Saturday, The anganwadi and toilets were painted by volunteer( (Awareness and Active Group) with few children and villages children , This 7 hours programme of 30 volunteers ,staff and local community completed painting , planting 50 saplings around the anganwadi and villages ( neem , chickoo, jack fruit,poppy tree(Singapore cherry), mulberry, amla,)various variety planted provided by Kolar Forest department. The responsibilities of takeing care of plants is given to each children in the village, anganwadi workers and grampanchayat member Chandrappa to water and safe guard the plants. 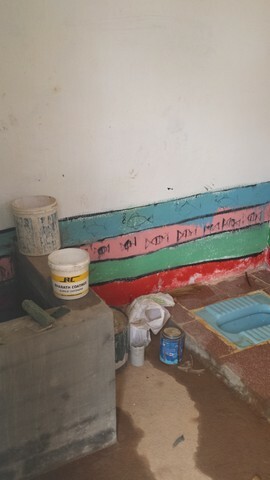 The toilet built was also painted by the children . Today monthly review meeting was conducted at Bangalore, the PWX work progress was reviewed , As per discussion with Mr. Rajesh on Saturday Ist December ,foundation is planning for one more project in the Areleri grampanchyat , in this regard field visits will be done on 5th December , the toilet and rainwater harvesting will be completed on 4rth December 2012. 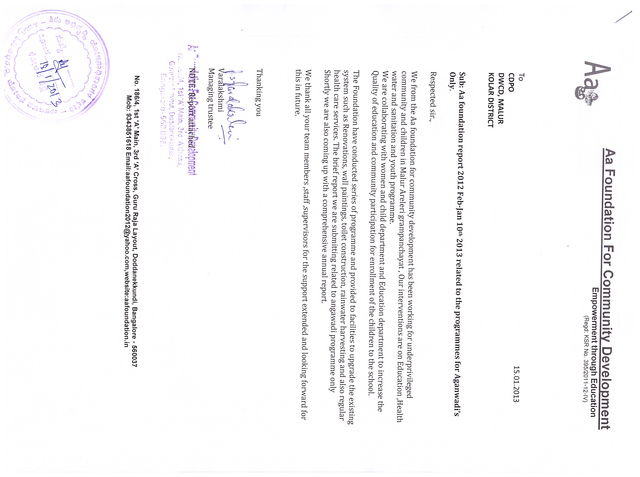 Accounts and planning related to the PWX programme was done with Krishnamurthy. New staff Nandini has been selected for the role of field educationist to upgrade teaching ,learning among children at Anganwadi. Advisor Mrs Indiraswamynathan and Technical Advisory KalpanaNiranjanmaka also part of meeting and discussed about upgrading and increasing teaching in Anganwadi. Planned to have a checklist and phase wise curriculum. Ms. Nandini will play a role of facilitator in Anganwadi for disseminating teaching methodologies to children and teachers as well Reporting the same to foundation and to PWX specially on training children to use toilet and safe drinking water, health related aspects related every day. The second phase of PWX grant has been received Rs 56,672/- . On 29th kolar was Bundh, which was called by all political parties for permanent solution of water crises,hence the work didn't take place, the materials were in need. today hoping the work will resume. planning to paint the Angawadi after 4rth December. on 29th kolar was Bundh by all political parties called off for permanent solution of water crises,hence the work didn't take place, the materials were in need. today hoping the work will resume. planning to paint the Angawadi after 4rth December. windows fixed,walls completed.Roof materials arrived. 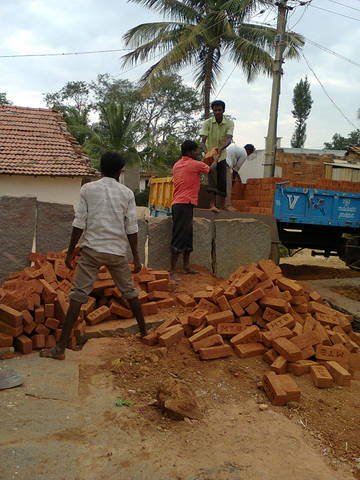 dicussed With rajesh on field challenge during construction,fund relatd. Suggestion and changes noted. 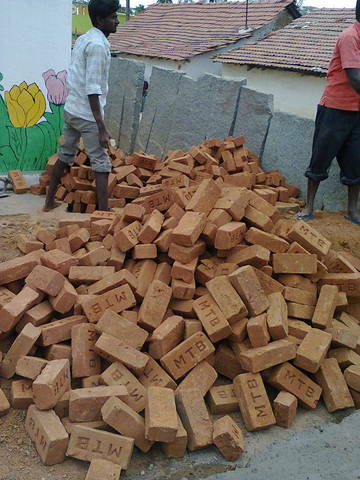 purchased brick load and two more course of foundation layers completed by labourers . Non co operation by community .Mtg decided to coduct on 22nd . 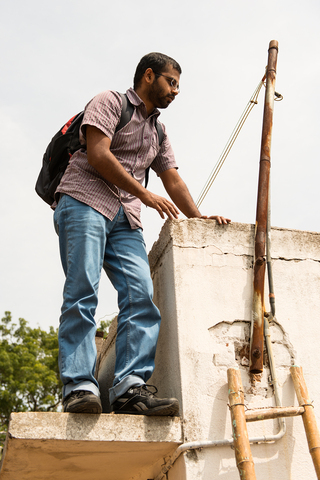 on 21st krishnamuqthy repnrting and settling accounts and planning 2nd phase of construction. 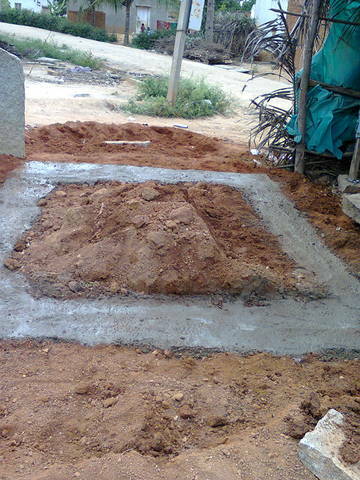 on 18th sunday , the worker started to dig the foundation , and completed , the materials for the foundation stone and sand has arrived. 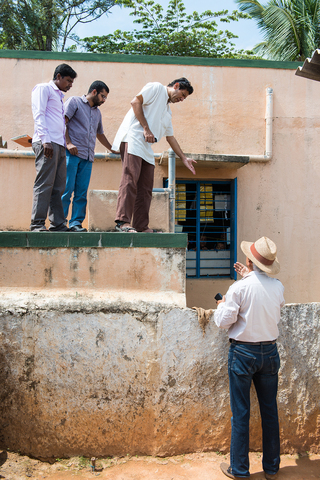 Chandar babu sir gave technical details and guided on process.finalised toilet drawing. Taken advance for material purchase. I joined Rajesh Shah of Blue Planet Network and Peer Water Exchange, along with other guests, to visit schools in rural Malur district that Aa Foundation has proposed doing rainwater harvesting and sanitation projects. Photos of the visit are included. On 5th and 16th of oct foundation management had discussion with rajesh on implementation.Cost.Design.And other issues related. The RW and toilet is built in government land premises planned for anganwadi, as well the anganwadi will cater 30-40 children every year, the maintenance is done by the anganwadi workers and GP. Developing practice to use and creating awarness is done by field staff from organisation. 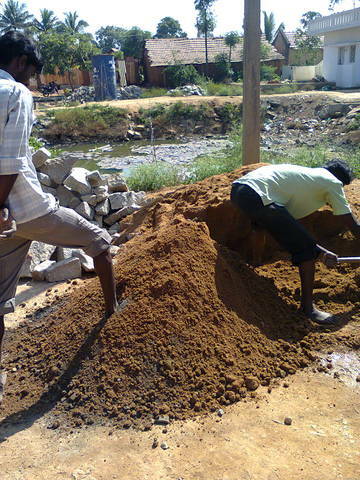 Later during construction , they participate d in cleaning,provided worth of 2500 rupees sand and stones. The project supported the organisation overall goal of achieving the local level network for development , not only awareness and teaching , the facility was also provided to them . 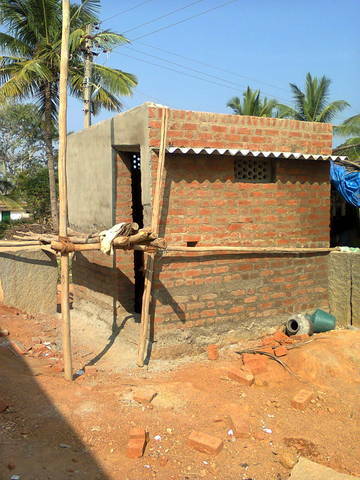 community are now interested to build rainwater structure's for their houses, which will be taken forward with them with their contribution in further discussions. There was no clarity given by the GP in their involvement, as many times they said the project has been sanctioned to construction new anganwadi building with out toilets? 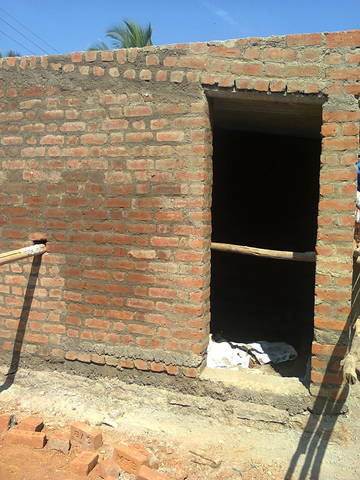 The toilet built will be used by 40 children and two teachers of the Anganwadi center.The effort from field staff along with ANW is making effort to bring more children to AW. 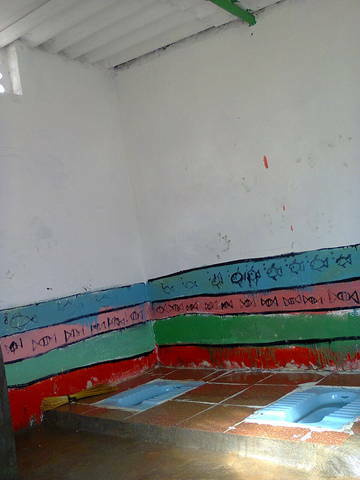 The children were not used to use the toilet as of no practice by parents and community either , the village of 91 HH has three toilets. 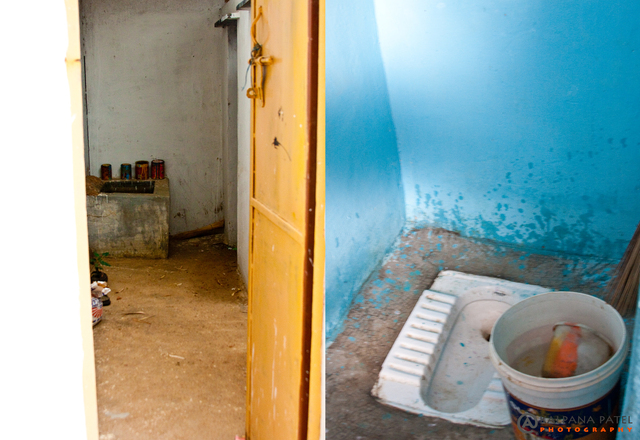 The children, Adolocents and women in the village are most effected people without toilet facility. 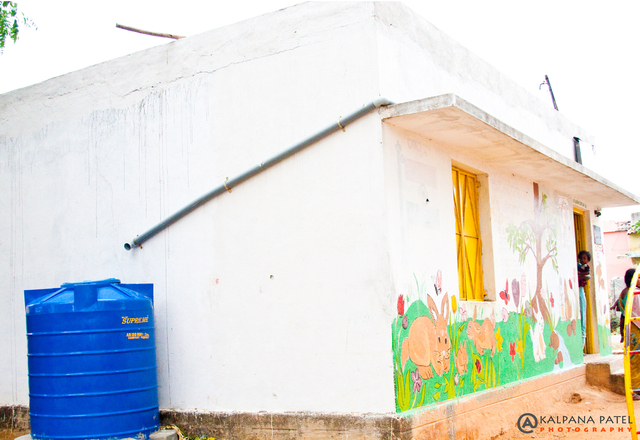 The ides of installing rainwater harvesting structure for the Anganwadi building and toilet is to see the children are getting practice using and also motivating community through awareness on usage of toilets in their home premises. we often in our visits observed the wet pants of the children , where it showed lack of training for children for break period in class time is not done by AW. 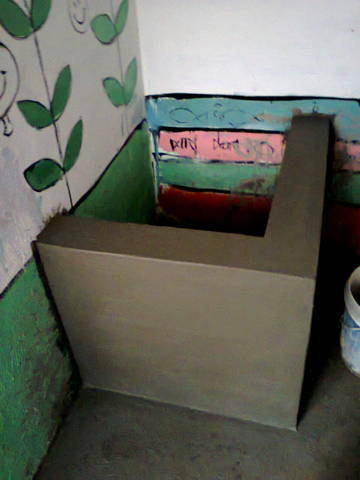 The toilet built has two seater as the children are from 3-6 years and a water storage cement tank inside the toilet, with space for cleaning themselves or showering. 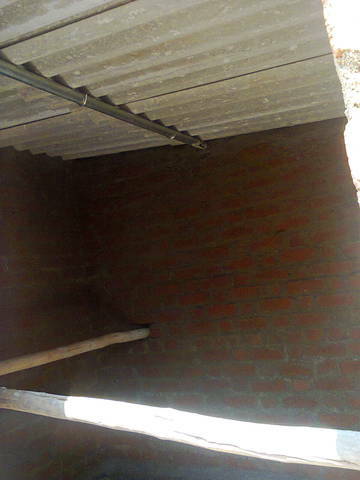 The inside water small cement tank is stored water from the outside ,where a 1000ltrs of tank is installed , which fills by Grampanchayat bore well water,also during rainy season from roof stop rainwater.the water is also presently used for cooking food and cleaning premises of Angawadi. 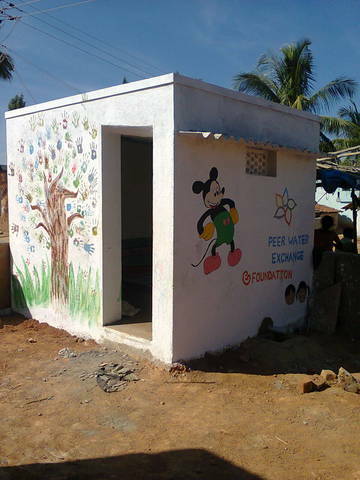 The inside and outside walls of toilet and classrooms are painted with child-friendly paintings by volunteer from Maa fiber link communication,Pvt,Ltd who sponsored the event,( until now three such projects have been completed by them) to attract and making them to retain in the class room till evening every day.earlier the strengthen of children was to increase in lunch time only. The Fiber link communications also planted around 50 tree saplings in around th e Anganwadi premises and villages, which is communicated and given responsible to school children to take care. 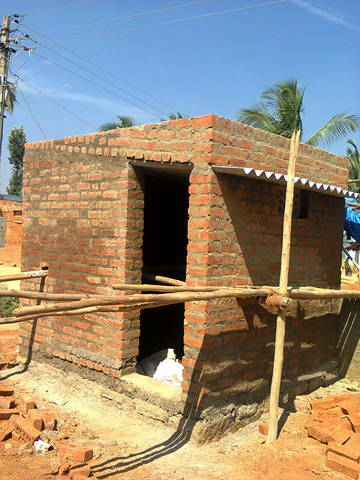 The organization had taken initiative to built toilet and rainwater harvesting based on the need, the community especially women and children face the sever problems of basic amenities such as water and sanitation. The children/community are not proactive to use toilet as the 91 HH villages had three toilet built by little privilege people in the area. 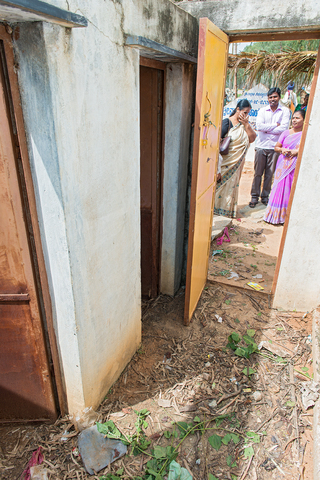 Other 250 community do open defecation. 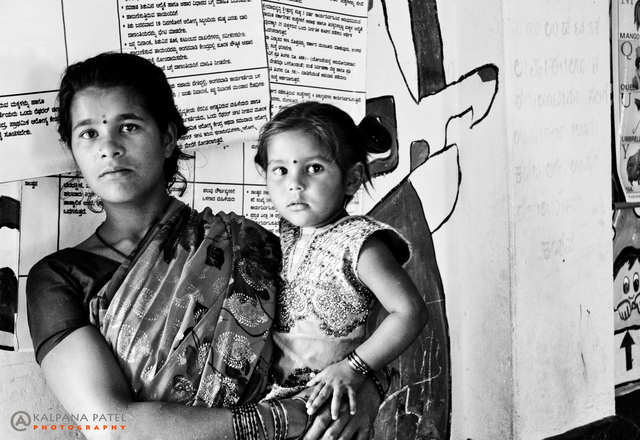 Our very idea of bringing institutional change selected the anganwadi, the local institution which functions 5-6 hours a day without toilet facility for tiny toddlers of 3-6years who attend daily. 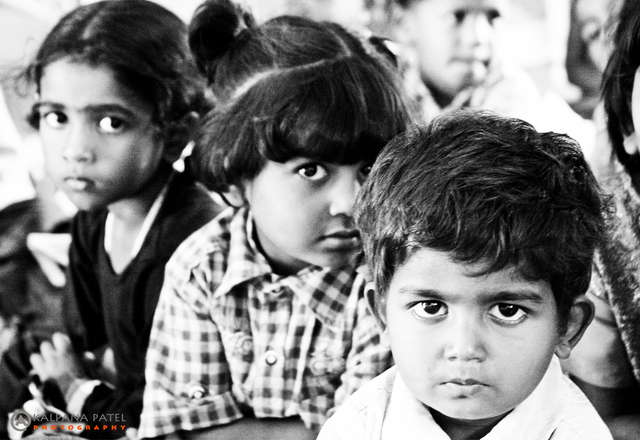 Our observation among children, usually we see either the children pass urine in Anganwadi compound or within the classroom. 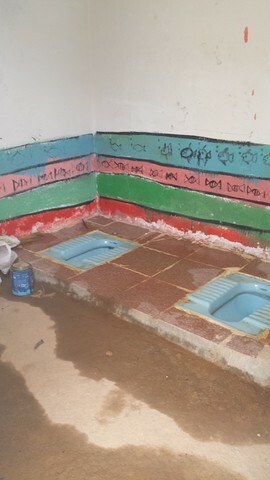 Now the children and teacher s are using the toilet, especially children feels happy for new facilities and teachers as they also had difficult earlier. 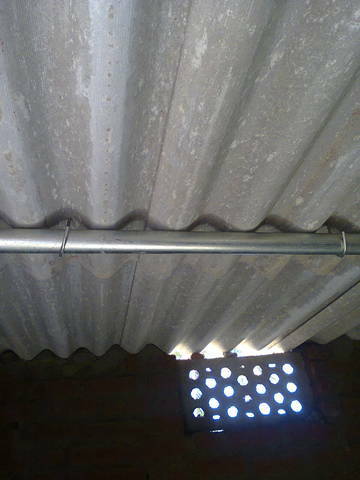 The water storage tanks fitted stores water supplied from GP, used for cooking and cleaning purpose. 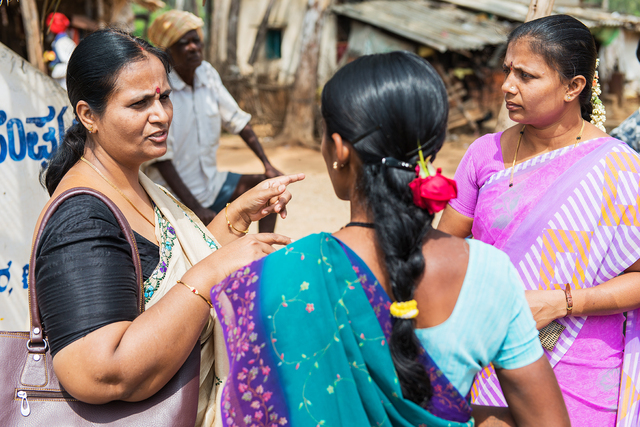 The time table, awareness and follow-ups are done by the field educationist Nandini, ensures the toilets and cleanliness is maintained inside the premises. Teacher and helper , the staff of Anganwadi center will be using.